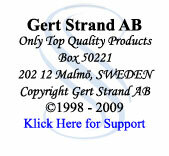 In the 1980's Gert Strand introduced a fast-acting yeast that was perhaps the first Turbo in the world. By 1996, however, competitors had surpassed this product's quality, and he began selling other manufacturers' Turbos. Selling only high quality is the company policy. Now, in the year 2000, Gert Strand proudly introduces new, improved, fast-acting Turbo yeasts, in every price class. We are especially pleased to recommend Prestige 8 kg Turbo alcohol yeast. This yeast ferments eight kilos of sugar in a 25 liter mash. While ordinary fastacting yeast produces 12-13% final alcohol, Prestige 8 kg Turbo Yeast produces 18%, and often 20%, an increase from the usual alcohol yield of at least 50%. Calculations: 17 grams of sugar in a one-liter mash, fermented to a low Oechsle degree on the negative side (lower then 1000 on a s.g.
hydrometer) yields 1% alcohol. Thus, for example, for 25 litres of mash at 18% we need 25 x 18 x 17 grams of sugar = 7650 grams of sugar, or approximately 8 kg. regarding the fermenting temperature must be carefully followed.) The mash is so pure that one can add some sugar to it, and combine this mixture with, for example, fruit juice, to create a strong wine or fruit drink. These Turbos are all-natural yeasts and are all in one bag, with the nutrients and the yeast mixed. We know of no better Turbos anywhere, and if we find one, we sell it.